An award-winning view into the past. Mullet Key is the location of the original Fort De Soto batteries and post buildings. Even though Battery Bigelow was destroyed during the hurricane of 1921, the Fort De Soto batteries were placed on the National Register of Historic Places in 1977. Visitors can walk through Battery Laidley, home to the last four surviving carriage- mounted 12-inch seacoast mortars in the continental United States. 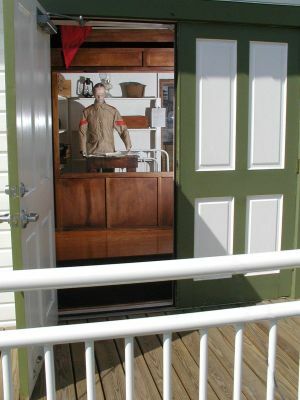 In the 1990s, additional historical interpretation material was provided to fort visitors with the creation of the display room, room descriptions, and a history booklet about Battery Laidley. Fort visitors saw only Battery Laidley and thought the battery comprised the entire post, not realizing that there were 29 wooden buildings and structures as part of the former military post. The area's history was researched and plans were made to reconstruct some of the old brick post roads and mark the various post buildings' foundations. Old photos and maps were researched and bits of the old brick road were gradually uncovered. When President William McKinley declared war on Spain, Tampa had already been selected as the embarkation point for the American troops since it was the nearest city to Cuba with railroad facilities and a deepwater port. Construction of the Fort De Soto gun batteries and various post buildings began in 1898 and continued through 1907. The Quartermaster Storehouse building was originally constructed as the Post Exchange, but was later transferred to the Quartermaster's Department. The army post remained active until 1910 when the 39th Company Coast Artillery Corps was transferred to Fort Morgan, Alabama. A caretaking detachment was then left in charge of the post. During the 1920s and 1930s, hurricanes hit the area. In 1939, the Fort De Soto post buildings were sold for salvage and torn down. Wagons used to roll down red brick streets just like this one in front of the Quartermaster Storehouse Museum. 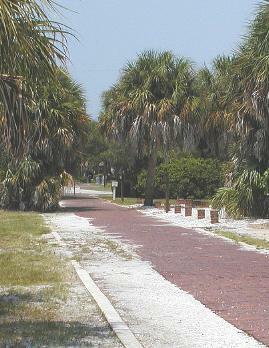 With the construction of the post's brick roads and cornerstones of the post buildings in the mid-1990s, the historical trail leads park visitors from Battery Laidley to locations of former post buildings. With the historical trail completed, park staff, volunteers, and visitors discussed the reconstruction of one or more of these buildings. The concept became a reality in 1999 when the Friends of Fort De Soto, Inc., a citizen support organization, applied for and received a matching grant from the state Historical Museums Grants-in- Aid Program for museum exhibits. Many people worked together to turn this project into a reality. Using historical photographs, Army engineering condition reports, and government documents, architects worked diligently to equal the size, scale, and massing of the original building. To meet the Americans with Disabilities Act regulations, a handrail was attached to the wooden ramp leading to the front door. Park staff constructed the entire 833-square-foot wooden building. The head carpenter acted as the site contractor and the park's mason laid the brick footers. Many employees worked to install the cedar shakes on the roof while others painted the exterior of the building. Our Quartermaster Storehouse is much more suitable to today's soldier - the building has features not found in the original such as air conditioning, fiber-optic lighting, concealed Polyiso insulation in the walls, door, and ceiling, in addition to a fire-suppression system. Once inside the museum, a visitor first encounters the post's quartermaster. All around him are supplies he would have issued to the soldiers. Walking to the left, the earliest history is revealed on the wall panel. In the 16th century, Spanish conquistadors encountered the Tocobaga Indians in the Tampa Bay area. As visitors continue walking clockwise through the museum, professionally designed graphic wall panels describe local area history. There are several panels on the Spanish-American War and the impact on the Tampa Bay area. Both adults and children truly enjoy the interactive touch- screen computer program disguised as a box of military supplies. Subject choices available to visitors include information, images, narration, and historical film clips. Most park patrons have difficulty visualizing the 12-inch mortars firing while visiting Battery Laidley. Now a historical film clip shows a gun crew loading and firing a mortar. In addition, visitors can learn about the area's earliest history up to the present day, which includes information on the Friends of Fort De Soto, Inc., nature trails, and other park features. Three display cases contain Spanish-American War items, recovered artifacts from the park, and World War II military history. An original practice bomb, which was found in the park after Mullet Key was used as a bombing range, is also on display. ...don't talk to the quartermaster! Not all exhibits focus on the military, however. A porch scene provides a glimpse of daily life with a period woman's dress, a deck of playing cards, a rattlesnake skin, and other items. The largest wall panel is a combination of three photographs showing the post buildings. Since most park visitors are unfamiliar with the army's coast artillery corps, one wall panel provides the history, photographs of soldiers in uniform, and contains patches and pins. The museum exhibits were completed and installed in time for the official dedication on November 11, 2000, - Veteran's Day. Since the dedication, many people have visited the Quartermaster Storehouse Museum and are very impressed with the quality craftsmanship and the museum's historical exhibitions. Visitors frequently ask if more buildings will be reconstructed and when. With the addition of the reconstructed Quartermaster Storehouse Museum, we hope to spotlight the area's historical significance and provide much-needed public education on the role Fort De Soto played in the history of the United States. In 2001 the Quartermaster Storehouse Museum received a meritorious award from the Florida Trust for Historic Preservation. Alicia Addeo, M.A. American Studies, is a history specialist at Fort De Soto Park.